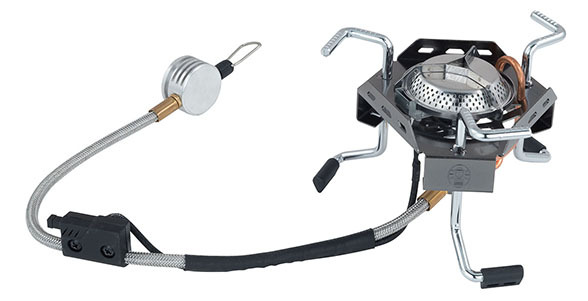 This extremely high power ‘spider’ type stove is ideal for trekkers and backpackers. Features include a cross burner wind baffle to maintain the performance of the flame and Piezo ignition for easy match free lighting. Low burner height combined with a long braided steel hose allow the cartridge and body of the stove to be positioned independently and minimising the possibility of spillages. Manufactured from steel the combined pan supports and legs are engaged with a secure spring lock system for safety and can fold back around the stove body creating a compact package when stored in its own carry bag for transportation.